I've travelled all over the country and Canada for business. 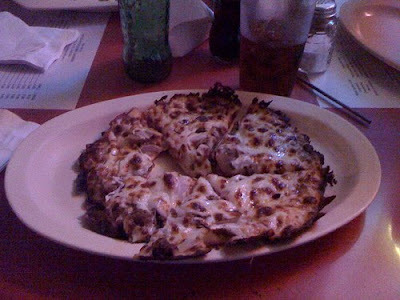 As a result, I've eaten pizza at all kinds of different locale's including Chicago and NYC, however, the best pizza I've ever had is Fleur de Lis in my home town of Baton Rouge. Fleur De Lis was an existing cocktail lounge out of the city limits on a gravel road, back in 1946, when Mama & Papa Guercio bought it. Mama Guercio decided to make a small pizza as an appetizer for the lounge customers and her pizza was enjoyed so much that she begin to sell them. She originally made the pizza in small pie pans she brought from home. When she realized they needed a larger size, she used a rectangular cookie sheet and the "square" pizza Fleur De Lis is famous for was born. If you haven't been to Baton Rouge and have the opportunity or if you live there and haven't had a pizza from Fleur De Lis, you need to go! 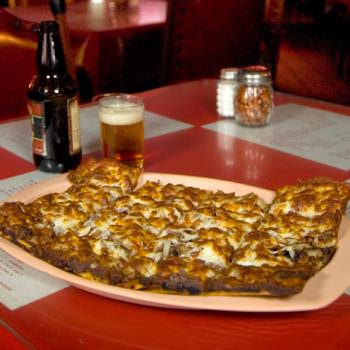 However, if you don't live there anymore and are missing some Fleur De Lis pizza, you are going to love me! I've figured out the Round The World recipe!!! Yep, I finally did it. I don't live in Louisiana and haven't for years so I can't get home to get my fix anymore. I've been craving it therefore, through trial and error, I finally came up with the recipe. It still needs a little tweaking here and there but you would be hard pressed to tell the difference. At any rate this is still a darn good pizza recipe! In medium to large skillet, brown ground meat and Italian sausage (removed from casing). As the meat is cooking keep breaking it up so, when it is done, it is ground and not lumpy. Add onion, mushrooms, fennel, Italian seasoning, garlic, olives, tomato paste, olive oil, salt, pepper, Tony's and saute until everything is browned and cooked thoroughly. Taste and adjust seasonings, if necessary. Alternately place pepperoni and salami on pizza crust and spread cooked meat mixture on top. Make sure to spread it so that it is about a half inch thick, any thicker and the crust will get soggy. Generously top with provolone cheese, one layer of sliced isn’t thick enough so I used two layers. Bake at 425 degrees until cheese is mostly browning on top. The quantity of pizza mixture is sufficient for 3 round pizza crusts. I used Boboli but in the future, I am going to make the following Bisquick recipe and press it into a rectangular cookie sheet. A good crust makes all the difference in the world and is crucial to a good pizza. Any leftover meat mixture can be frozen for future use. Preheat oven to 425 degrees. In medium bowl, combine baking mix, water, and olive oil and beat hard until a dough forms. Press dough into a greased pan, dipping your fingers in flour to prevent sticking. Prepare pizza as indicated above. Thank you! That looks like a great crust recipe...I'll have to try it! I am so exicted to find this recipe. I drive 3 hours from Mobile, AL just to eat this pizza. I don't expect the recipe to be perfect..."close" is good enough for me. Thank you. Love your blog. I tired it, with some modifications. I don't like Salami, so I skipped that part. I used a lg onion instead of small. I used Pillsbury Pizza Crust and made 2 9x13 rectangular pizzas. The recipe above covered them both. I also used 1 lb ground meat instead of only a small package. I also added a bell pepper. Otherwise,I followed the recipe exactly except for dropping the salami. RESULTS: Really, Really, Really good. Many thanks for posting this recipe for those of us who no longer live in BR. You all are so very welcome! I'm happy that you like the recipe and the blog! Come back more often! Whoopsie! I made a mistake in the recipe. It's Canadian Bacon, NOT Salami. My Baddddd! Sorry for any problems this may have caused. Thanks for sharing this recipe it's definitely a really good reward for my brother who got his Alcohol Server Certification last week. But still work on the dough first. I'm not really the cook-type but I'd like to do something special for him. Imagine my surprise when I found this recipe. I am the owner of Fleur de Lis. Mama and Papa Guercio were my grandparents. They say any "imitation is the sincerest form of flattery". Hope you can come see us soon.